Hello Everyone, I am back with Wplus9 February 2015 Release Previews. Today I am showcasing this beautiful image by Dawn. Pick of the Litter stamp set. 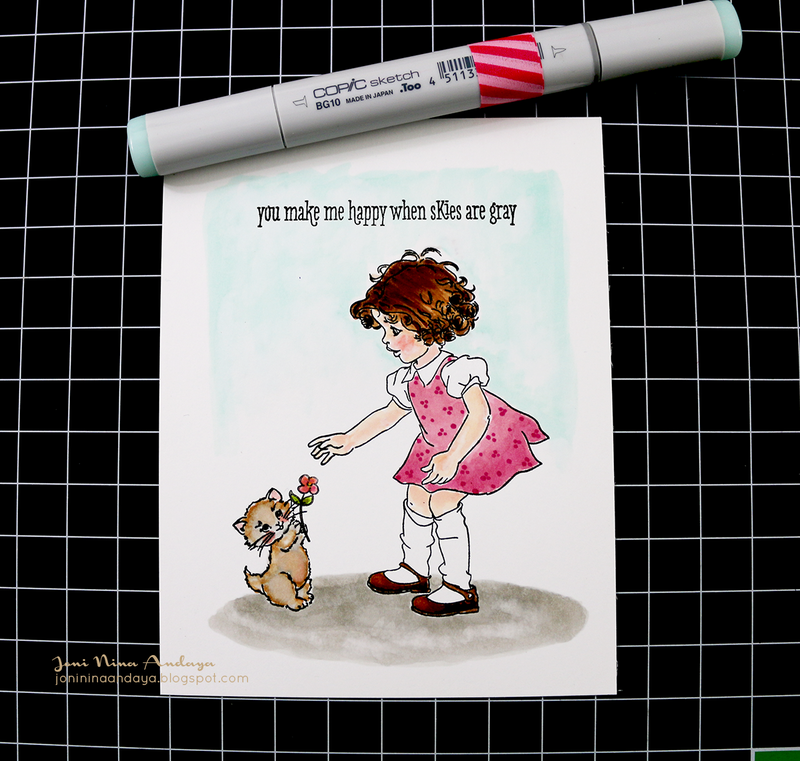 To begin my card I stamped my images from Pick of the Litter stamp set, then color them with copics. For the girl's dress I added some dots using Copics for added design on the dress. 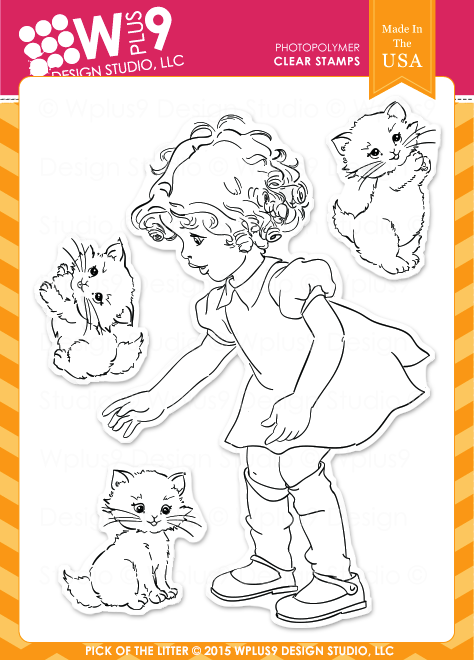 The flower that the kitty is holding is from the Unforgettable stamp set. Next, I colored the ground gray and the background in Aqua color in BG10. Next, I die-cut the frame 5 times to create an elevated frame with out using the foam tape and adhered the clear acetate behind first frame before adhering it with the rest of the frames. I couldn't help it, I have to make a shaker card with this pretty frame. This is just a note: The first frame was die-cut on watercolor paper and did some watercolor with with it. For the inside of the frame I used some Martha Stewart sequins and Pretty Pink Posh sequins in Sparkling Clear and some Silver Shimmery Seed Beads. All of the new products that you will see this whole week will be available February 5th. Oh wow! Love the beautiful hearts in here and your coloring! Beautiful watercoloring and love her cute dotted frock!!! Is she ever sweet! I love your coloring and the pattern on her dress. Joni this is just as sweet as can be! Love the frame and your fabulous coloring! Super pretty shaker card! LOVE your coloring! Adorable image...truly awesome card! Love your coloring!! Your pick of the litter card is truly adorabe!! Awesome coloring & sentiment!! Lovely card! Love the soft gentle coloring!! Oh wow, this is so GORGEOUS!!!!!!!!! 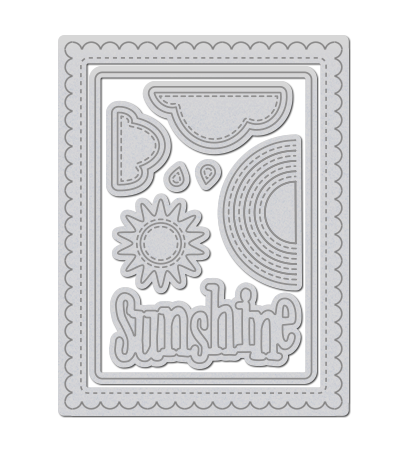 love your coloring, the pretty color of the die cut scallop frame, and the fun sparklies inside!